Helps stabilize the knee following sprains, ligament instabilities, or meniscus injuries. The DonJoy Sport Hinged knee brace is ideal for those who are suffering from mild ligament (ACL, PCL, MCL) injuries, knee sprains, or meniscus injuries. The durable bilateral hinges help stabilize the knee, while the Drytex material and thigh & calf straps provide compression. The breathable Drytex fabric provides comfortable compression and keeps you cool and comfortable. This brace is ideal for daily activities and non-contact sports. Please note the DonJoy Neoprene Economy Hinged Knee Sleeve is the same brace as the Donjoy Drytex Sport Hinged Knee Wraparound/Sleeve the difference is the material. This comfortable compression will help stabilize your knee and minimize swelling during movement. Your movement will not be impeded because these hinges were designed to mimic the natural motion of your knee joint. Exclusive to DonJoy braces, Drytex is a neoprene alternative that is much more comfortable to wear. Drytex allows for better airflow between your brace and skin so you won't find your brace making your leg excessively hot during sporting activities. XXXL 29 1/2" -32" 21"-23" 22"-24"
Which size should I go for. Small or X-small? Can I adjust the calf if I take the small size? 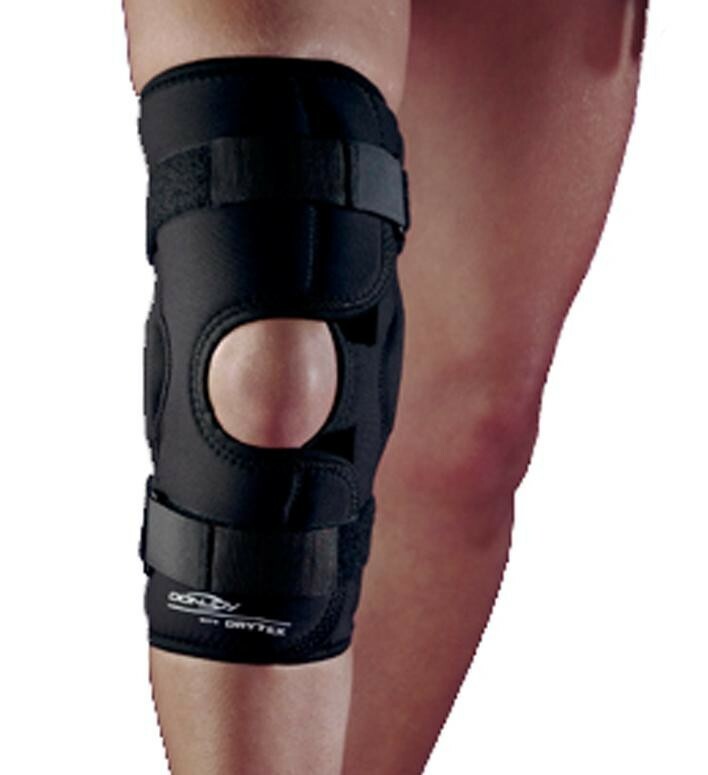 We would recommend the small size of this DonJoy Knee Brace. You can pull the lower strap tighter if you need to for a better fit.